I have a bad habit. One that I need to break. I second guess myself. A lot. I need to learn to trust my instincts. Sometimes I will see something while out pickin’ that I will know that it could be fabulous with a little work or repurposing. But something will happen and I will talk myself out of it, and usually walk away, later on kicking myself. This happened about a month ago………………. I have a weakness for Swedish Mora clocks. I love them, their curvy lines, round faces, and painted finishes. The original antique ones can be quite pricey, between $2500-$4000. Yep, pricey! Should the lottery gods ever smile on me, I will have an authentic original Swedish Mora clock! But until then……. A month ago, my hubby and I were out of town on a day pickin’ trip. We stopped in a flea market that was nice and large, an old closed nursing home down in Arkansas. We went in prepared to find that one of a kind treasure! Once we stepped through the door, I realized quickly that we wouldn’t be finding any treasures there! It was filled with junk……and I don’t mean the good junk……trashy junk. And to be honest, it was a little creepy! Everything was set up exactly as it was when it was operating as a nursing home, only now all the rooms were filled with really. bad. stuff. There was also a weird energy…..which I probably wouldn’t have noticed if it had been filled with “the good stuff”! But I don’t have the patience to sort through a lot of trash….especially in a creepy place……with bad energy………. not to mention hubby was not “feelin’ it” and he is less patient than I am! So we decided to not waste anymore time and move on to someplace else…..when on our way out the door, I spotted this. At just a glance, my heart stopped and sputtered. As I got closer, I saw that it was a relatively new table top clock made out of cheap particle board. But……it had the same curvy lines, round face and style as a Mora clock. 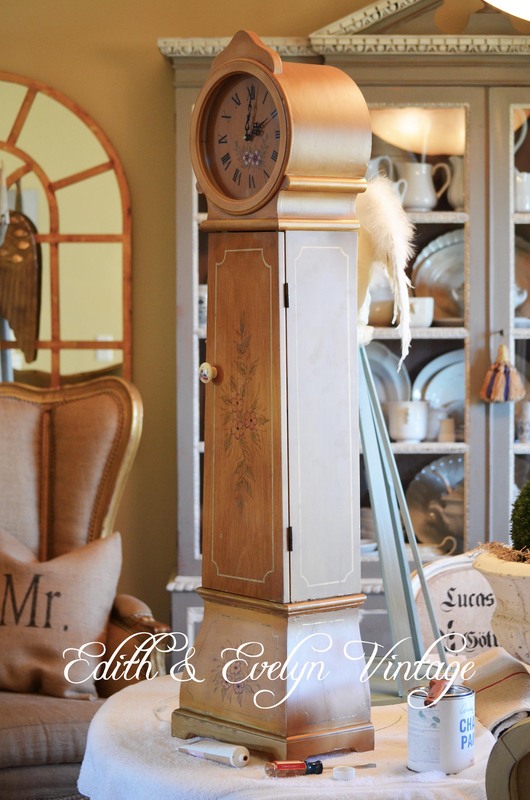 I mentioned to hubby that with a little Annie Sloan chalk paint magic, it would be a great “almost” Mora clock! He didn’t respond with “Yippee”, so I (as usual) started second guessing myself. And walked away. And left the creepy building. We came home with it haunting me that I didn’t buy it. I started imagining it painted and distressed and standing next to the other reproduction Mora that I have. I couldn’t sleep for “designing” a new look for it. This went on for a week. No sleep, kicking myself. I hinted to hubby that I wish I had bought it, hoping he would suggest jumping right back in the car and driving the 2 hours back to buy it. Nope, didn’t work. Suddenly it hit me! My wonderful, gorgeous, fabulous newly married niece now lives in this very town! I quickly contacted her, and asked…..ok, begged…..if she would please, please, please go to the creepy nursing home and buy the clock for me! She took pity on me (I told you she was fabulous), went and bought the clock (thank goodness it was still there!) and I met with her later on to pick the little beauty up. Isn’t my little knock off Mora clock gorgeous?!? I painted her in Annie Sloan Duck Egg and Old White with lots of crackling and distressing, waxed in clear and dark wax. I found an old vintage brass laurel leaf garniture to add to the top. And we found an old porcelain clock dial from France that we replaced the fake one with! I used Annie Sloan’s new Craqueleur to get the crazing in the finish. I love the way she turned out, and she even keeps the right time! Now I just have to figure out where she will be displayed. Is it possible to have to many “Mora” clocks…….hmm….. I don’t think so. I think they are like chandeliers, one can never have too many! It’s beautiful here in the Ozarks today! Hope it’s beautiful where you are! Oohhh! Now I want a kinda looks like a Mora clock too. She whines. A great article. Great job Cindy! I love clock too but have never come across anything resembling a mora clock!! Love the story of how it came to be yours! I know what you mean by bad vibes/bad energy. Gorgeous! I know exactly what you mean about sleepless nights thinking about the one that got away! Glad that you made this one happen. That turned out so beautiful. You’re so lucky it was still there after two weeks!! This clock was meant to come home to you and your family. Thank you Pati! I think the only thing that may have helped it not selling before I could get my hands on it is the “creep factor” of the old nursing home!